Just this past week alone, there have been 32 earthquakes detected in Oklahoma (magnitude 2.0 to 4.7). Our seismograms and “spectrograms” of today’s magnitude 4.7 quake are shown below. Students Make Their Own Earthquake! 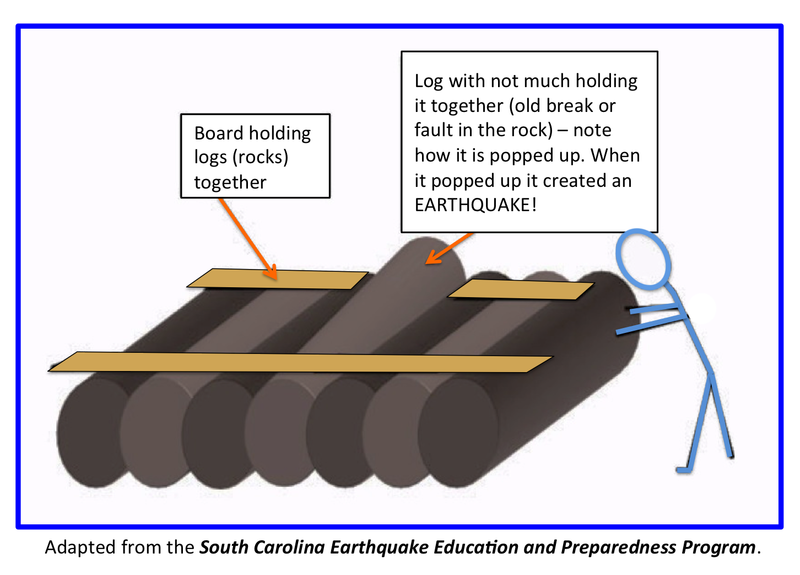 This is a clear and simple illustration (adapted from the South Carolina Earthquake Education and Preparedness Program) of the commonly accepted “ancient zones of weakness” model for the cause of earthquakes in the Central and Eastern United States (and other “intraplate” regions far from plate boundaries). According to this model, preexisting faults and/or other geological features formed during ancient geological episodes persist in the intraplate crust, and, by way of analogy with plate boundary seismicity, earthquakes occur when the present-day stress is released along these zones of weakness. If you benefit from these blog posts and feel inspired to contribute to our work, please visit this page and make a donation. 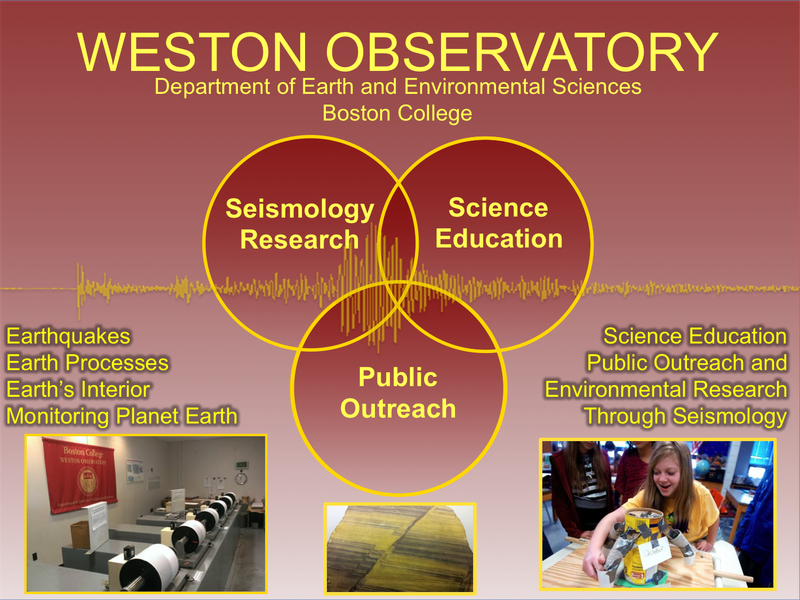 At Weston Observatory, we’ve been busy this year envisioning and building an earthquake observatory for the 21st century, and we are now embarking on a fundraising effort to support our vision. This year’s fundraising theme is education and public outreach. Funds contributed this year will primarily go towards bringing earthquake and related science into schools and public libraries, supporting our monthly public colloquium for adult learners, and of course towards maintaining this blog. If you feel inspired to make a contribution, please click here to go to our donations page. Thank you for any amount, small or large. A few days ago, one of the huge springs on our garage door opener broke, with quite a big KABOOM! This seems to be a perfect analog of the Elastic Rebound Theory of earthquakes, and the phenomenon of Earthquake Triggering! 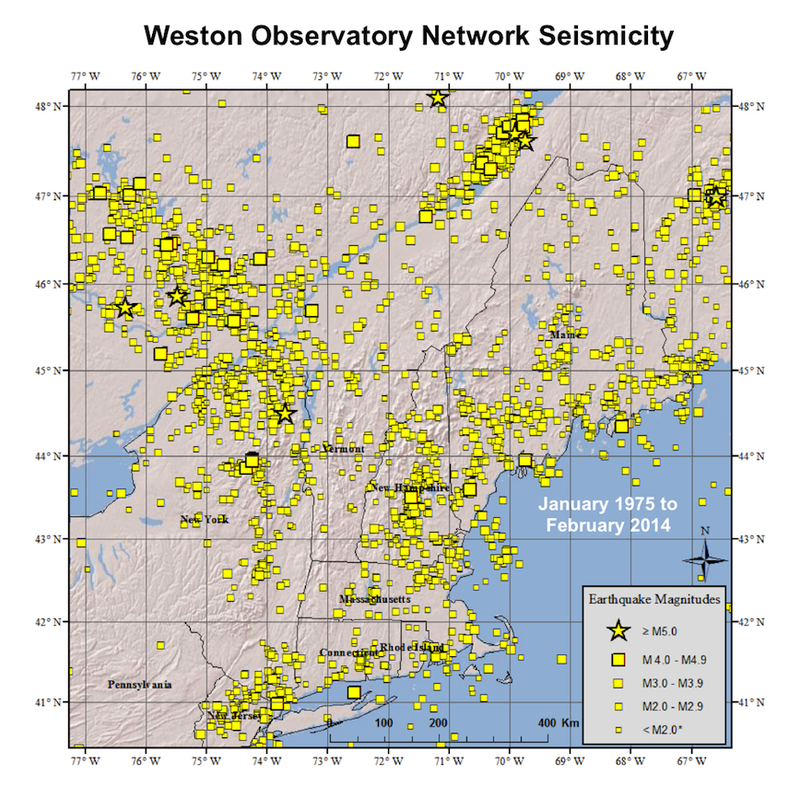 New Updated Seismicity Maps for Northeast U.S.
Click on the maps below to see the Weston Observatory seismicity maps of the Northeast United States, updated as of early February 2014. The first map shows historical seismicity (from June 1638 to December 1974), and the second map shows network seismicity (from January 1975 to early February 2014). 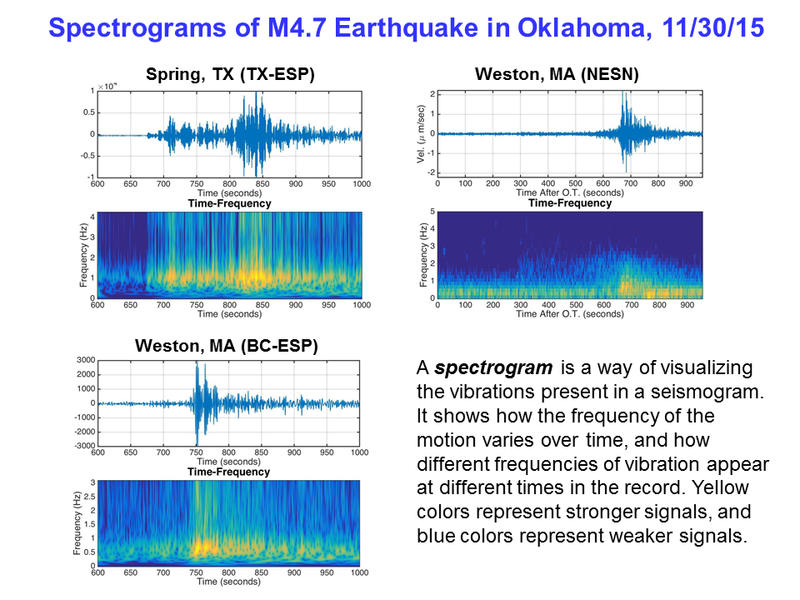 The Detective Work of Seismologists: Earthquake or Blast? Residents of the city of New Bedford, MA and the surrounding area felt something very strange at 10:52 am on January 9th, 2014. They heard a loud blast and felt a distinct rumble. A seismic event had occurred. 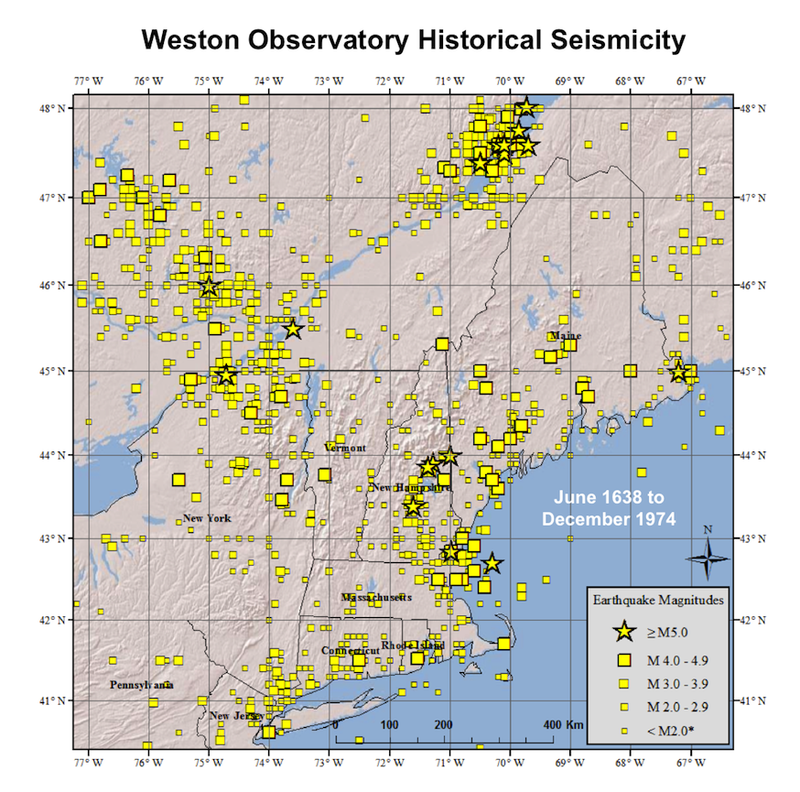 Weston Observatory scientists quickly determined that the magnitude of this seismic disturbance was 1.9 and that it was located very close to New Bedford. Not very big, but shallow enough to be heard by many people in the area. 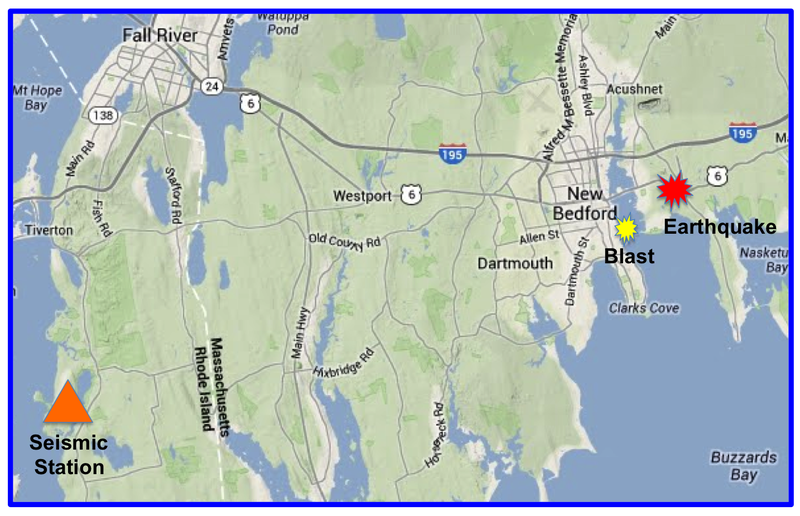 While speaking to the Massachusetts Emergency Management Agency (MEMA), Weston Observatory scientists were informed that there may have been blasting in the New Bedford harbor around the same time as the earthquake and very close to the possible epicenter. So was this a real earthquake? It was up to the scientists to find out. Several phone calls went out and eventually, Weston Observatory scientists reached the New Bedford harbormaster who put them in touch with the Captain of… the Kraken! The Kraken is a drilling and blasting barge located in New Bedford and is tasked with widening the shipping lanes. 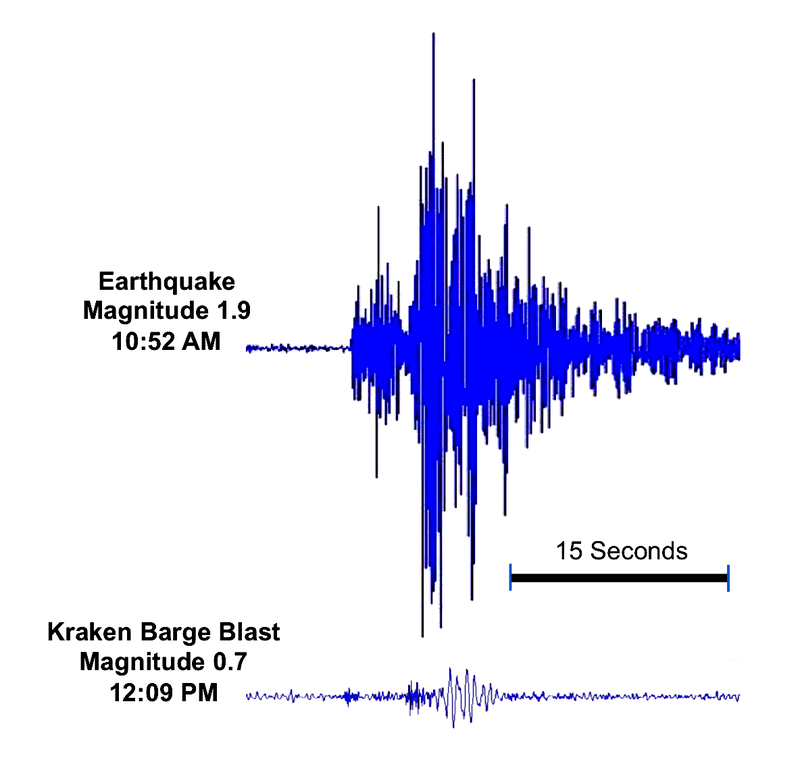 As it turns out, the Kraken did not blast until 12:09 pm, over an hour after the earthquake occurred. In fact, the Captain received many phone calls asking if it was they who blasted and caused the shaking… but it was the earthquake! The two seismograms shown below are from a USArray seismic station in Tiverton, RI. On those seismograms, you can see the Kraken Blast and the earthquake. 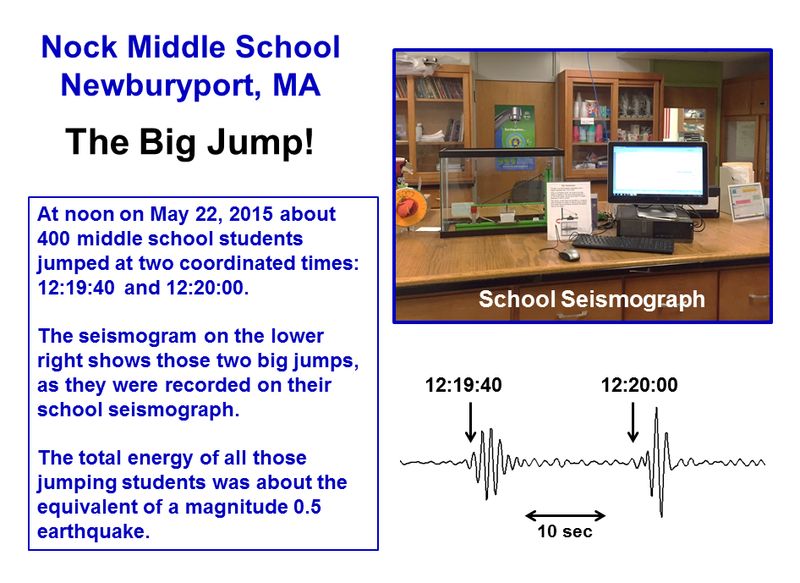 Notice the big difference in magnitude (the earthquake is an order of magnitude larger). And notice (below) the well-defined, high amplitude wave labelled “Rg” on the seismogram of the blast. 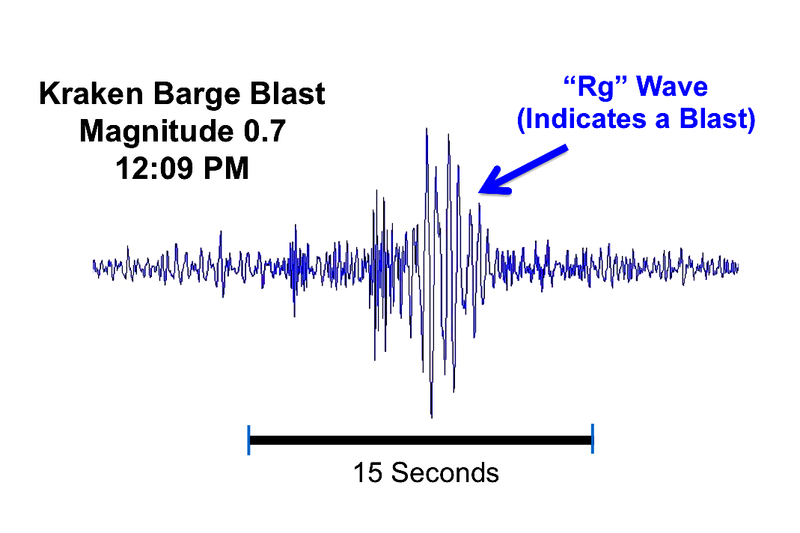 The presence of these “Rg” waves on a seismogram are one of the ways that seismic “detectives” use to identify blasts, and distinguish them from earthquakes.